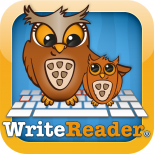 In 2011 we decided to develop WriteReader. The methods behind the app have been thoroughly tested in Danish classrooms over a period of 18 months on children of 4-6 years of age. 1 ½ years – In this period the app has been thoroughly tested with English families based in DK. Where the child can create his or her own book. Library – where the books can be shared or sent. The app is developed and is tested primary by schoolteachers in cooperation with leading Danish scientific researchers. . Furthermore, the app itself has been tested by two American families with children of 5-8 years of age. 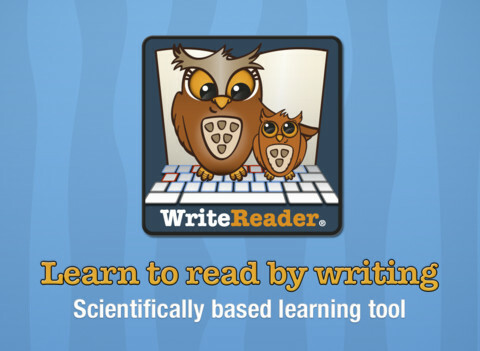 Write to Read is a scientifically based learning tool that teaches children from the age of three to read by helping them to create their own books. The app is developed by Danish primary school teacher Janus Madsen. Madsen has more than 15 years of experience in teaching children to read and write. Write to Read has been tested in cooperation with leading scientific researchers and is co-financed by the Danish Agency for Research and Innovation. Write to Read is based on scientific research that substantiates children benefit by learning to write whilst they learn to read. Using Write to Read and a little help from an adult, children learn to spell and read in a relevant and meaningful way by creating and writing their own texts. The child writes a sentence using his or her current level of written language and the adult “translates” the child’s writing into proper or correct text. When the child compares his/her writing with the adult’s, the child begins to observe, assimilate and learn words and syntax. Books created by the children can be printed, e-mailed and posted to social media directly from the app. In this way, the child is inspired to create and understand the practical use of written language. The child enjoys the creative experience and the authoring of his/her own stories. Write to Read features a specially designed keyboard that incorporates the sounds of the letters. Vowels and consonants are marked in red and blue frames respectively. The keyboard can show both lower and higher case letters to help the child recognize and learn all 52 different letters. Furthermore, the app has a record-and-play function that can help the child remember the written text and serve to support the child by enabling them to play back the audio version of the story at a later point. The primary target group is children from 3-10 years of age, but both younger as well as older children can benefit by using the app. Younger children can create books on their own by recording stories that complement pictures taken with the iPad, or with others, by typing more or less randomly on the keyboard and having an adult add the conventional writing afterwards. 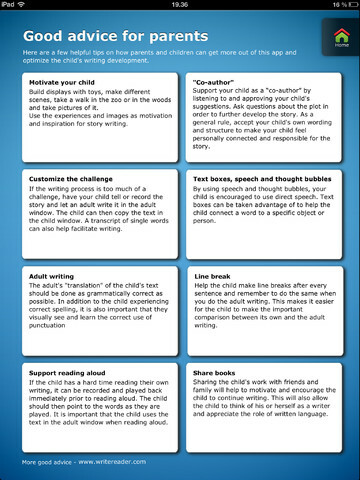 Older children can use the app as a book template to create longer and more complex books.